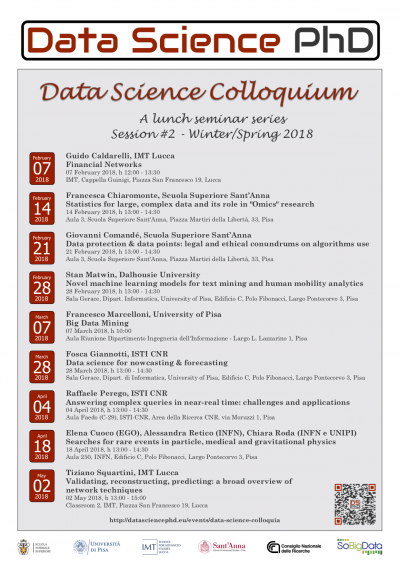 The new availability of huge amounts of data, along with advanced tools for data analysis, data mining/machine learning, data visualization, and scalable infrastructures, has produced a spectacular change in the scientific method and in the way our society makes crucial decisions: all this is Data Science. Often, the achievements of data science are the result of re-interpreting available data for analysis goals that differ from the original reasons motivating data collection. Examples include mobile phone call records, originally collected by telecom operators for billing and operations, used for accurate and timely demography and human mobility analysis at country or regional scale. This re-purposing of data from one side clearly shows the importance of legal compliance and data ethics, while on the other it calls for novel methods, both creative and rigorous, for transforming data into signals useful for nowcasting (the prediction of the present) and forecasting (the prediction of the future) and for validating the entire process. Can we forecast Seasonal Influenza with Supermarket Retail Data? Do the superforecasters exists? Can we use them to predict the success of innovations? Can we predict or simulate the human perception of performance in sports?